Windows Vista or 7: Choose Start→Computer. Windows 8: Open the desktop and click the File Explorer icon on the taskbar; then click Computer in the Location list on the left side of the screen. Right-click the folder you want to share and choose Properties. Click the Sharing tab and then click the Share button. The File Sharing dialog box appears. Click the arrow in the drop-down list, choose Everyone, and then click Add. 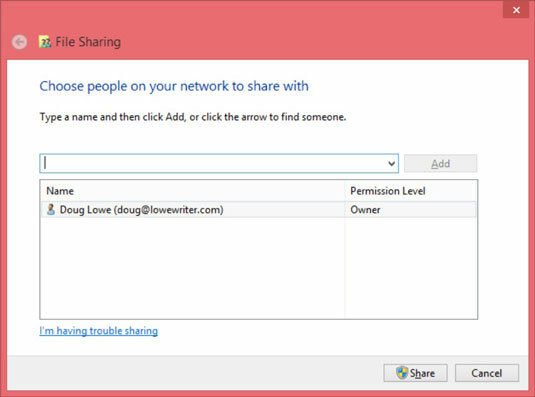 This action designates that anyone on your network can access the shared folder. If you prefer, you can limit access to just certain users. To do so, select each person you want to grant access to and then click Add. Select the level of access you want to grant each user. Reader: A reader can open files but can’t modify or create new files or folders. Contributor: A contributor can add files to the share but can change or delete only her own files. Owner: An owner has full access to the shared folder. He or she can create, change, or delete any file in the folder. A confirmation dialog box appears to confirm that the folder has been shared.